On Shabbos, the Progressive Party in Norway, the smaller of two parties within the ruling government coalition (with 29 of 169 parliament seats), announced that it intends to initiate a law banning circumcision in the country for males under the age of 16. The Jerusalem Post reported that supporters of “the Norwegian bill, which was discussed during the party’s national gathering over the weekend, claim that circumcision constitutes mental and physical harm to children and constitutes a serious violation of children’s rights.” While it is true that after my Bris I couldn’t walk for a year, most babies don’t start walking till they are about a year old, so in all probability, the real rationale behind this proposal is that Norway is considered by many as the most anti-Semitic and anti-Israel nation in Europe. Historically movements to ban circumcision are centered in attempts to move the Jewish commitment from God and refocus it on man. In fact, almost every campaign to destroy the Jewish people started with a ban on circumcision, followed by a ban on kosher slaughter and finally a ban on teaching Torah (Norway reversed the order, they.began with Kosher slaughter). That paragraph was repealed in 1851, but that didn’t mean the country’s attitude changed. Schechita (Kosher slaughter of animals) have been banned in Norway since 1930. Technically the ban is against any method of slaughter that does not involve stunning the animal first. Interestingly while Norway has banned schechita which is humane, ignoring international agreements the government allows whaling, which involves the harpooning/slow death of whales. It’s come to the point that in Norway “Jew” is used as a slur name. Norwegian media often spreads anti-Semitic canards. For example, in On January 12, the Norwegian newspaper Aftenposten published an article about Jared Kushner, US President Donald Trump’s son-in-law and his senior adviser: “The Jew Kushner reportedly pushed for David M. Friedman as the new ambassador to Israel”, Aftenposten wrote. The newspaper had later to apologize for calling Kushner “the Jew”. A popular form of modern Antisemitism is portraying the Israeli govt. or IDF as blood thirsty or Nazis. For example, Dagbladet, a newspaper of the Norwegian Left, published a cartoon in which Palestinian terrorists leave an Israeli prison with the German motto of the Buchenwald concentration camp: “Jedem Das Seine,” (to each what he deserves). This past November “Utbildningsradion” the Swedish Educational Broadcasting Company, aired “The Occupation of the American Mind: Israel’s Public Relations War in the United States,” The movie suggests that the “Israel Lobby” (a nice way of saying the Jews) control public opinion in America. 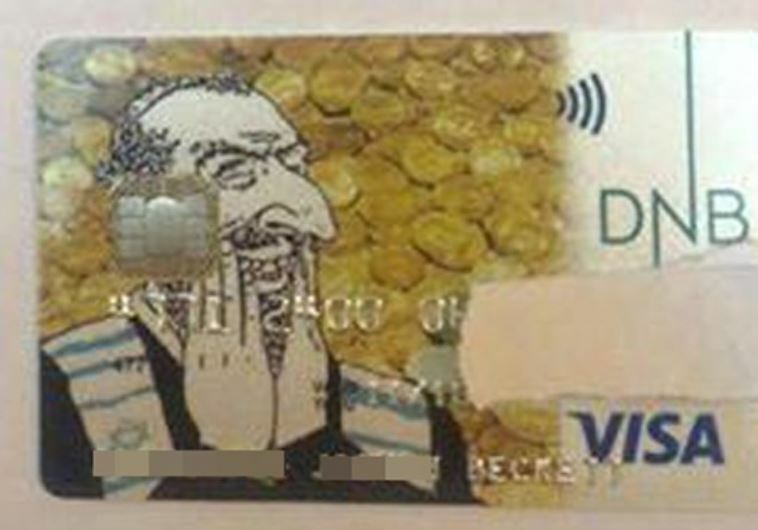 In 2015 one of Norway’s largest banking firms, DNB, issued a credit card featuring the image below (until they got caught). 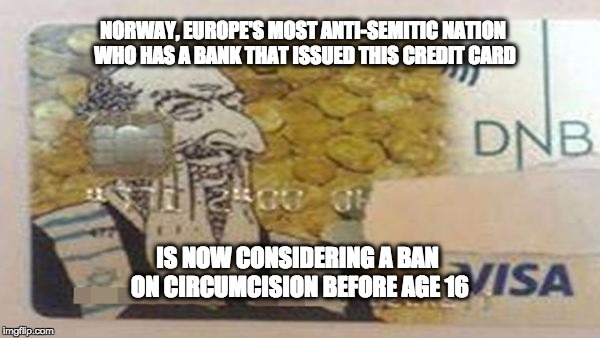 Make no mistake about it, this proposal to ban circumcision, has the same purpose as the paragraph in the 1814 constitution described above—keep the Jews out (despite that Jews are a very tiny minority in Norway, the WJC estimates about 1,200 Jews in the country). This proposed bill hits one of the most basic provisions of Jewish practice. Circumcision is not a rabbinical interpretation…it is a direct order! Just read Bereishit Chapter 17, verses 9-11. It’s right there in ink and parchment.